Retro photo effects are still in demand. 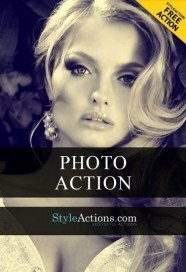 It’s one of the most trendy photo directions now and the sphere of its usage is unlimited. 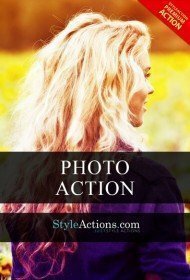 Generally, such photo effects are used for portrait work. They can get some mystery and thrilling hint to the portrait. The hypnotizing black and white portraits look really deep and sensual. However, achieving this deep appearance can become a tedious and sometimes even unrealizable task to overcome. Photographers even with the wide experience can face the problem of tight terms and the lack of inspiration, amateurs in their turn will face the problem of lack of experience. But all these problems can be solved by just using the professional retro photo effects. Our retro photo effects can be used by professional photographers, designers or by just some amateurs who desire to create some professional retro look without additional time-consuming procedures. Remember that retro photo effects are all the rage! And out retro Photoshop actions will provide your photos with the magnificent retro look in three simple steps! For Photoshop newbies or just for preventing additional questions we write a small explanation how to use our retro photo effect. How to use: unzip the action folder. By the way, inside the package, you will also find some text file where you can read all main usage steps. Then you will need to run your Photoshop, it must be Photoshop CS4+ English version. Make sure that you are running the English version, please cause it won’t work with other language versions. Open both your image you want to edit and our Smart objects then copy your image into the Smart object and enjoy the retro design! All these steps will take only a few seconds of your time and you will get a professionally designed vintage photo for just 4$! It so simple that even the little kid can figure out how it works! It is not a jaw-breaking task so relax and apply it! What can retro effects do with your image? • Change the color grade. Make it softer. • Make your image remarkable and memorable. Do you want to come back in time and add the stunning retro look to your modern image? Are you terrifying from the process of creating the decent retro effects? We can solve both your problems! Just download any of our free retro PSD action and apply it to any image. Any designer or photographer can find our effect useful in their work. Why is that? Let’s think out of the box! Any designer and photographer face the problem of creating some retro designs or photos. The process can be tiresome and can take days or even weeks of your time. Yes, of course, you can start creating your own effects, but let’s be wise! There is no need to do a double work when there is an opportunity to get ready free retro effects. Our retro Photoshop actions can turn any your design into real retro masterpiece in few seconds! You just need to determine what exactly result you want to obtain. 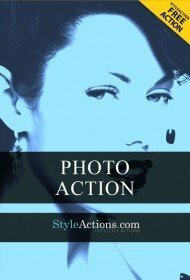 Whether you need a retro-looking text or just complete some thematic photo session shoots you can find appropriate effect here. Our Photoshop action will work with any Photoshop version starting with cs4 and higher. The only feature you must to abide is that you must run the only English version of Photoshop in other circumstances you will fail. This fact is crucial so turn your attention to it. How to apply our retro Photoshop actions. The applying process is really simple and it consists of several steps. •	Open your image you want to transform via your Photoshop. •	Cope the image inside the Smart Object. •	Turn on or turn off some layers of Smart Objects. By doing it you will change the final look of your image. Of course, you can continue your editing process after applying the action and bring your design to the perfection. If you are not satisfied with the results after applying just turn off the Smart object and you will get your first layer without any destructions. Before using our free retro effects, you must check that you image is in right color mode. Right color modes – RNG, 8bit color modes! If your image in the other modes switch them. Where can you use retro effects? The area of using our retro action is wide and unlimited. If you a web artist, designer or photographer you can use our actions in your working process with the aim to complete or improve your works. 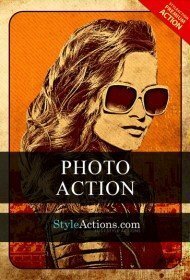 Retro effects are in high demand and they are widely used for portraits, advertisement materials, and modern art. Even if you are a general user and you want to add some sophisticated look to your own photos, you can download our action and use it for personal needs. The applying action is so simple that even the Photoshop newbies can figure out how it works. 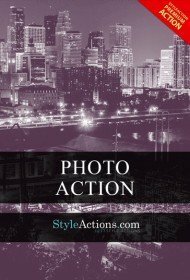 What kinds of retro effect Photoshop actions can you find on our website? We include all kinds of retro and vintage effects which can help you in creating the perfect work. •	Black and white photo effects. The most popular and classical variant of retro effects. •	Retro text effects. Don’t forget about text layers while editing the photo or creating the design. •	Retro frame photo effects. Frames will complete some portrait works, landscape or thematic photos. •	Lomo photo effects. A great variant if you want to achieve the oversaturated colors or prismatic effects! Oneofthemostpopularretroeffectdirection. •	Pencil sketch photo effects. Your work will look exactly like the masterpiece of the retro picture. Thegreatvariantforportraitimprovement. •	Retro painting photo effects. Your image will look like painting masterpiece from the old time. 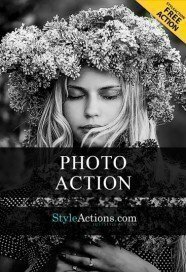 •	Sepia tone photo effects. Elegant and traditional retro effect for simple designs. 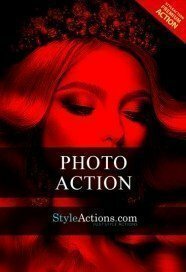 •	Triton photo filter photo effects. For those users who are tired of the sepia and black and white color variants. •	Color noise photo effects. Add some noise to your image and get the old look. 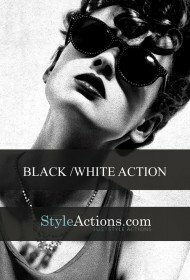 If you aren’t satisfied with our free retro action selection and you are looking for more sophisticated and exquisite effects, you can scroll down our premium retro category there you will definitely find something to your liking. And remember that the free download doesn’t mean the poor quality! 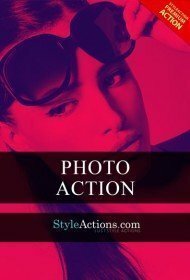 Why should you use this action? 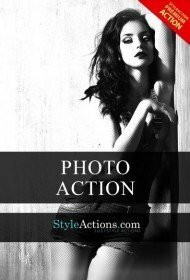 Turn your attention on the affordability of our retro photo actions! You can purchase any our retro effect for just $4 and use it unlimitedly for your present or future photos! Great investment in your future projects at the affordable price! Include this retro effects into your poster art, collages, and graphic element. All dedicated designers are interested in high-quality retro effects! They use them with the aim to satisfy crowd demands and tastes! The retro effect can help you to create any content, starting from old advertisings, texts written in hands and ending with retro posters. First of all, you save a plethora of your free time. Secondly, you get a quick result without compromising the quality. Thirdly, the price is so low that anybody can afford not only one retro effect but a bundle of effects for usage. In the fourth place – comfortable use and the safeness of your Image. Thanks to Smart object packaging, your starting layer will stay untouched even after several applying, removing and changing. You are free to experiment unlimitedly until your full satisfaction. Stop hesitating and start turning any your portraits or landscape shot into damaged aged photos without any time spending! 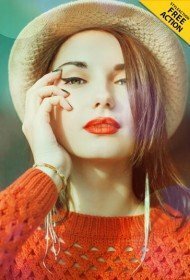 You can achieve the professional look just in few clicks just with the help of our premium retro photo effect Photoshop actions. It’s only the small part of retro effect we can offer you. For the extraordinary effects lovers we will also offer some extraordinary but still retro effects like smudge oil paint PSD action. If you will be interested in few our retro effects, you can download the bundle of actions for your b&w portraits for example- then it’s more logical for you to become a member an have unlimited access to all sire products. You can create your own pack or wait for our compilation, which we will do from time to time for our dear clients.We are sure that you won’t stop using the single retro effect so think twice about a bundle.